At some point I am going to produce houses again. All the farm houses that I will be using for my “Battle at La Fière Bridge project” must be finished as the first thing – and I am very eager to get going. Making these farm houses will give me plenty of that kind of houses and the next thing in line will be classic small town houses in the best Normandy style, like those in Carentan, St-Lo or Sainte-Marie-du-Mont. I will need to make up my mind about which way to go. 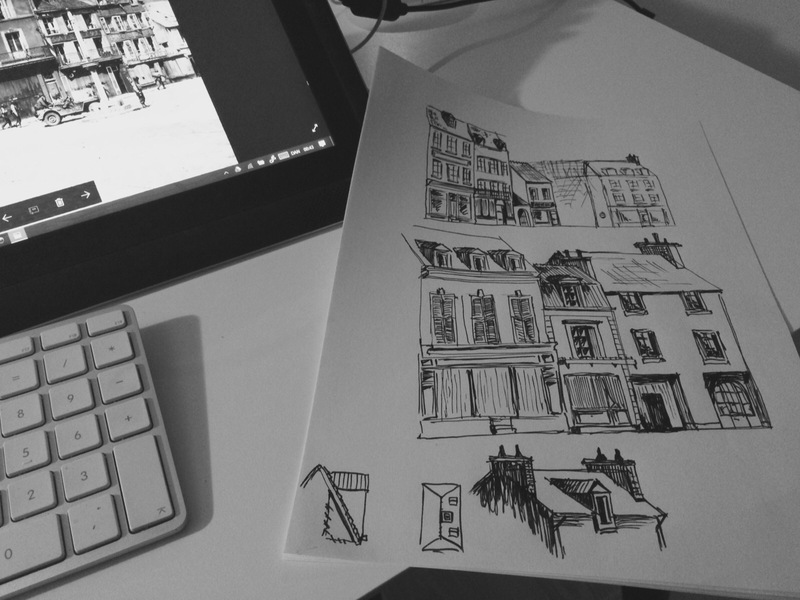 Until then I will keep studying photos and make sketches. Every time I been away from the hobby I always “restart” by buying lot’s of new products instead of working on the massive load of stuff I already have. 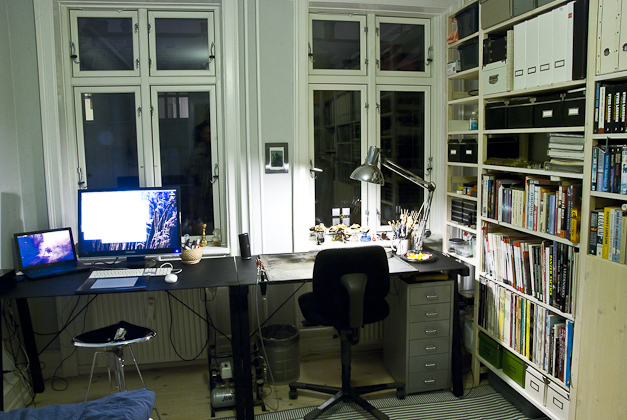 In this way the space I need to store everything need to be bigger for every break. The reason to why I take breaks has been because of moving to new places, but for some kind of weird reason I am away for at least a year every time. Anyway – I think I am back!? 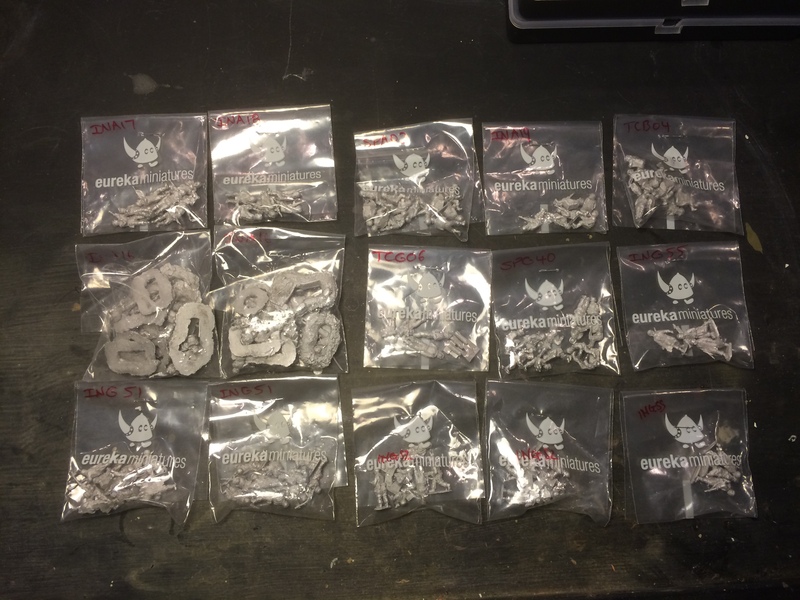 Just bought some Fallschiermjägers to be able to make a full Battlegroup Overlord company. 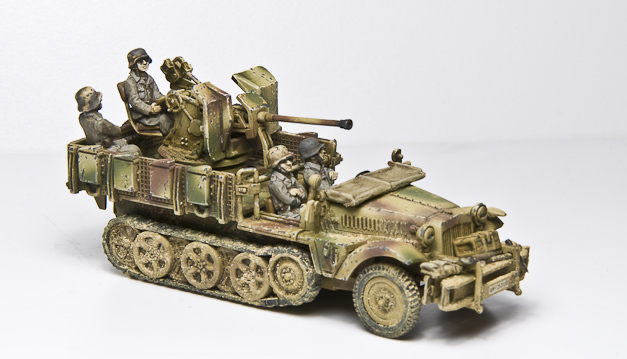 I have also invested in some of the new US stuff: crew for both jeeps and halftracks. The new US squads in trenches will become very handy. The new SS jeep crew also look very nice. 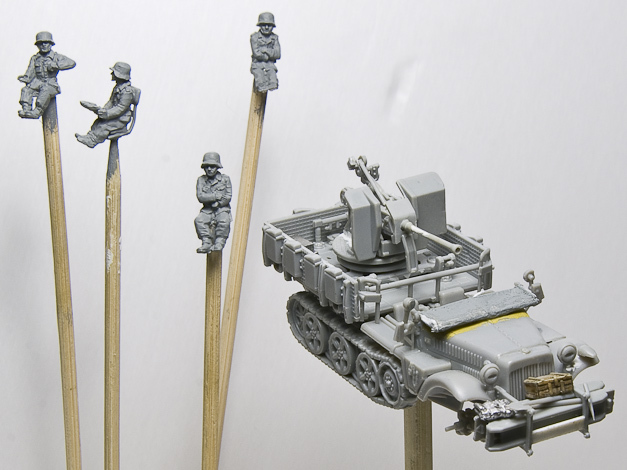 I bought some crew for Universal Carriers (I actually have a british company unpainted) and finally crew for my Hummels. Luckily I am quite found of making list, taking notes, organize and gather information which make it easy for me to be away for a long time and still be able to just carry on where I left. 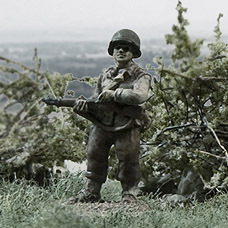 So my goal is still Normandy and especially the figthing on La Fiére Bridge. 1. I glue the figures to their bases using super glue, a mix of gravel and sand is added. When dried I paint the bases using Citadels Foundation. The color is “Khemri Brown”. This is then drybrushed with Vallejo Iraqi Sand 124. 2. Then I paint the figures with a base layer, again using a Citadel Foundation color, this time I use “Rakarth Flesh” and cover all of the figure. Vallejo Flat Earth 143 for trousers and rifles. For helmets I use Reflective Green 090. Vallejo Buff 120 I use for all the canvas stuff, such as belt, boot covers, canteen and ammo pouches, but some of this equipment could also come in another color, a more Olive Drab kind of shade and for that I use Vallejo Yellow Green 112. Vallejo German Cam Orange Ochre 128 for gun holsters. The acrylics are painted flat on with no painted shadows or highlights. 4. Now it is time for the wash. I use the Army Painter Quickshade “Strong Tone”. This is often used with the technique called “dipping”, but instead of dipping the whole figure in the varnish I paint it on with a brush. It is necessary to move the varnish around a bit with the brush to make sure that it looks okay. If some part of the figure don’t get any varnish this part will look apart and much lighter than the rest – so make sure that the whole figure is covered. Remember also to add Army Painter to the bases. It is important not to use too much varnish, if there is a thick layer on top of folds and other highlighted areas it will look wrong. But in the end most of the varnish will by it self seek down in folds and holes and look great, it just need a little help some places. 5. Then leave it to dry. This can take several hours, I usually add the varnish before I go to bed and then in the evening the day after I will be able to paint the rest. The varnish aint very healthy, so make sure not to sleep in the same room as the figures are left to dry. 6. It is time to paint the metal parts. I drybrush this on with a dark metallic color. 7. Now the only thing that is missing is a to make it all matt. I prefer using the Dull Coat from Model Master (the same as Testors), this step is important because the Army Painter Quickshade is a bit glossy. 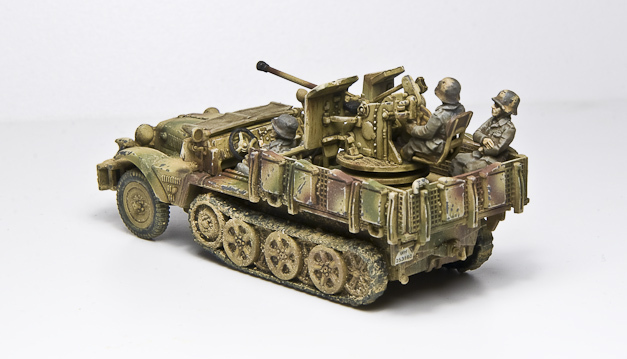 This is a quick way to get some figures painted but some that still look quite pretty on your gaming table. I hope this can be to any use. James Klein has asked me how I make my own bocage pieces – I will try to explain this by showing a few couple of pictures I took while i made them. I hope the scarce image material will be enough, I didn’t take them for doing a tutorial. First of I cut pieces of plastic sheet, the sizes is about 4×20 cm. This will be the bases for a piece of hedge. Next I glue cat litter to the bases using white glue. Because I want a certain hight I let the stones dry to the bases and then glue an extra layer on top of that. When I am happy with the height of the “stone wall” I let it dry before I add a layer of gravel on top of the litter. I add the gravel with a thin acrylic glue – I am pretty sure that white glue, thinned with water, will work great too. I let the gravel cover the whole base. Some places where I want the hedge to have a hole in it I add a pile of small stones. When the bases are dry again I paint them. I use the big bottles of acrylic colors from Winston & Newton. When the paint is dry I drybrush them with a lighter color. Now it is time to make the bushes. For that I use an old material, used for stuffing in furniture, called rubberized Horsehair. This can be hard to come by, I found mine on internet and bought a big piece that I will never be able to use all of. treated right this will look just like a bush with its branches pointing in all directions. I cut them in pieces that match the size of the bases (see to the right in the picture above). Then I twist it, cut in it and try to puff them up so that they aren’t too thick and dense. Then I dip them in my thin acrylic glue, which as well can be white glue thinned with water, and dip them into foliage. Several of companies makes foliage, make sure to mix different shades of foliage to make it look more realistic. When the foliage has dried to the horsehair I stick the bushes to my bases using a thick layer of white glue. It will dry for 24 hour and then the hedges are ready. I hope this explains how I make my bocage, if not – feel free to ask. Haven’t been able to be very active in company with my small toy armies for a week. A combination of work assignments out-of-town and making our flat ready to be sold has forced me to use my time different than normal. Selling the apartment has forced me to clean out the man cave which has made the room very popular, my girlfriend have been seen setting her foot in the room for the first time in ages… at the same time our two-year kid has totally lost interest of the room as there is no cool stuff to steal or destroy anymore. 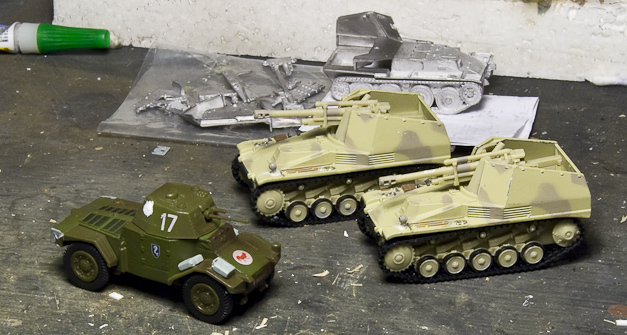 But still I have been doing some process with the StuG’s. I used most of a evening adding decals to the sideskirts. As much as I love the Archer’s dry decals I also hate them. I guess the biggest problem is my fat fingers in combination of the tidious task of making 12 skirts that have to look the same. Dry transfers gives a great result, but damn they can be annoying to fit onto the vehicles. The decal on the StuH 42 is inspired from one used in Italy that had the number 55 written the same place (but in black). 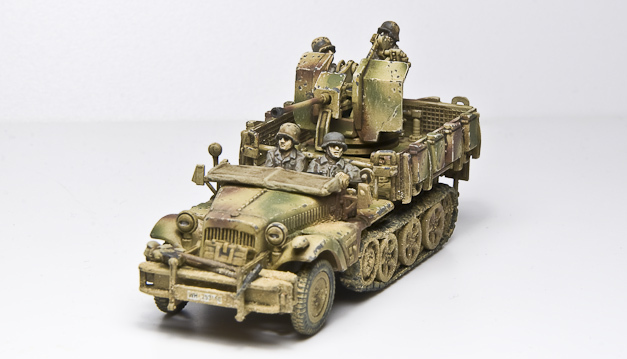 I also gave the vehicles a wash using AK Interactive enamel wash for DAK vehicles. One of the tanks I had either forgotten to spray with satin coat or maybe the surface had become too rough due to bad airbrushing – the result was that the effect of the wash became very dark. I had to re-paint it. I decided to skip the camo, not because of being lazy, I love to paint camo, but to make some difference from the other StuG’s. Wash done, next step is to paint tracks and tools. Now I have to paint the tracks, probably the most boring task ever (that or fitting Italeri tracks to a model). After that I will love to add chips and pigments. Just a little update: Had a long session with the airbrush this night. 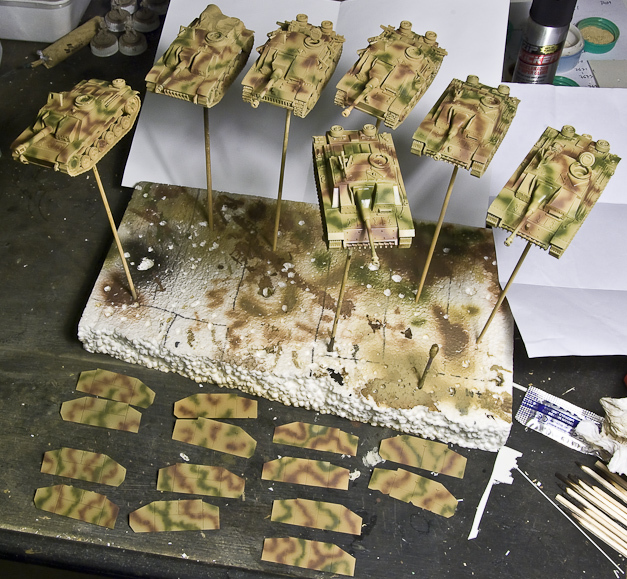 Painted 7 StuG’s which took me some hours… They got the dunkelgelb colour last night and today I did the camo. Last thing I did was to give them a Satin Coat so they are ready to get a wash. The StuG’s are from some different brands. 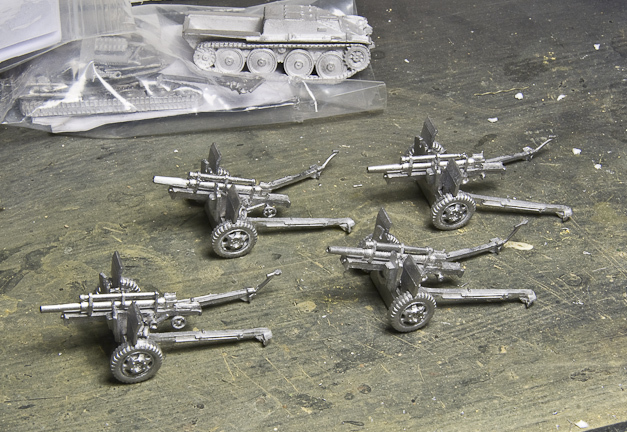 The three late versions are from Plastic Soldier Company, two from Italeri and two from Armourfast (one of them with a 105mm gun, that is actually a StuH 42). Man, those Italeri tracks kills me, it took me four times as long to build those two as it did the four others. Models like this that I just need a lot of I will in the future always, if possible, get as Quickbuilds. But I did in fact use some time on the Armourfast ones too, had to add details that wasn’t there. They are quite simple and you get much more for your cash buying PSC models. Air protection to the Panzers! 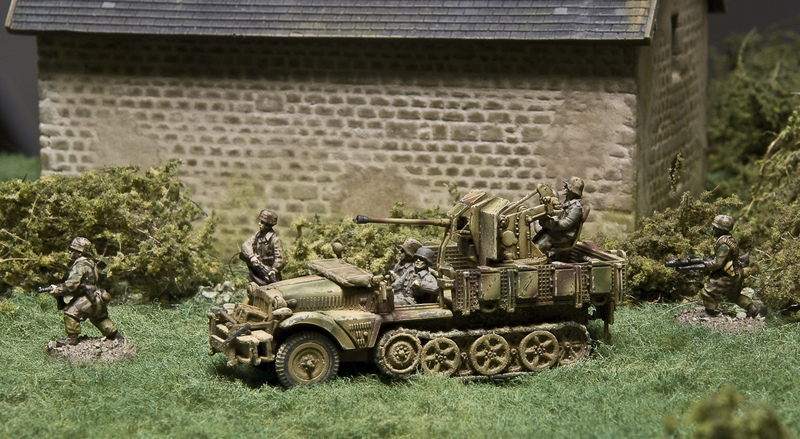 Sdkfz 10/4 ready. This last picture can be seen in bigger resolution by clicking it! I am making progress on my Sdkfz 10/4 and it should be ready tomorrow. My first camo with airbrush, not perfect but will work. 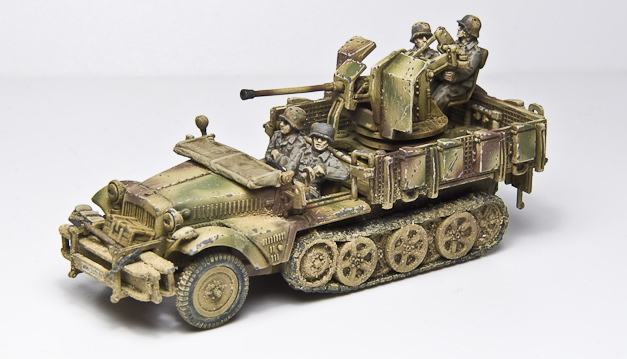 This is after a wash and some chipping – maybe too much chipping… The next step will be to continue the weathering using pigments, the wheels and tracks looks very clean but that will change tomorrow. The crew has just got a wash with Army Painter Quickshade, when they are dry and got some Dull Coat they will look super. This is supposed to be my next project. 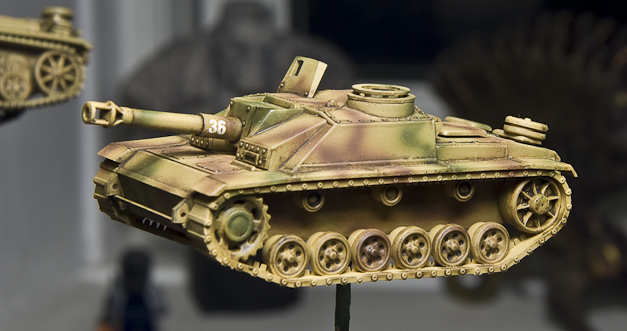 I need six and will add a Armourfast StuG that I have. 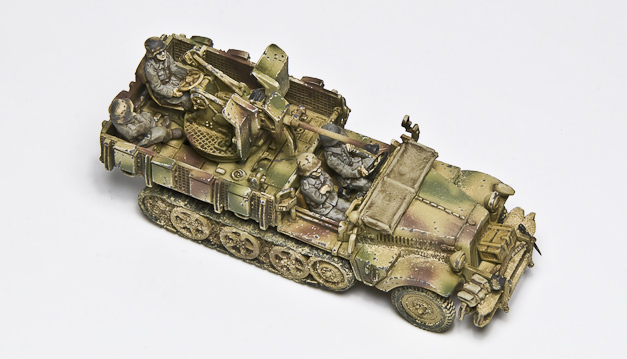 This is Sdkfz 10/4 from Caesar Minitatures gave me both joy and frustration to build. Most parts would fit together well but the building instruction was terrible and had several quite big errors, but was also far from precise. I wont say that the plastic is bad, but still quite a few pieces was destroyed when opened the box, worst was the gun that was broken in two, luckily the piece that was broken of was still in the box even though it could easily had been falling out. Other minor parts that was broken of was missing. By checking pictures of the vehicle I could put it together and make it look reasonable, in the it was a fun challenge, but in the future I prefer to choose when I want a challenge instead of getting it because of a bad model. I added the number plate and the tarpaulin on the windscreen, put some ammo boxes in the back to a figure to sit on and added stowage in the front. The figures are AB Figures. This is my first Diecast models a Panhard 178 for my recce patrols and two Wespes, all from Altaya. There have been some fixing to do before I can paint them, the stowage on the Panhard was really ugly, and when removed they left big holes in the plastic. I have to paint them before I can say if the quality lives up to the rest of my plastic and metal vehicles. None of this vehicles are some that I need very soon, so maybe I only paint the Panhard (have always liked the design of this funny little car) and wait a while with the Wespes. 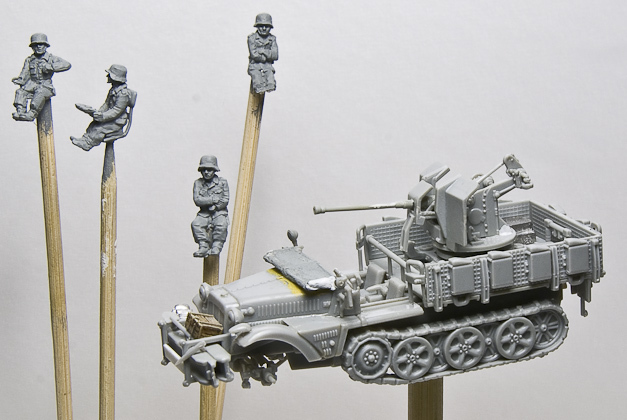 Behind the diecast models a Marder IIIM from MMS is being assembled, it seems to become a fine model. Probably a very easy task to paint this 105mm guns from SHQ, but still I have struggled a bit with them, it took me some time to find the right color and the wash didn’t look good at all – so how far they are right now is hard to say, I guess I will give them a dull coat and try to pin wash them one more time, normally I would use satin or clear coat but by using dull coat the enamels will spread out a bit and hopefully I can give the color some depth in this way. After this I will add weathering with pigments. Most of the stowage are from Goffy, the extra jerry cans are SHQ. Two Armourfast (to the left) and two Revell. Showing all seven Shermans that I have painted this last couple of weeks, nice and dusty. More Shermans to be shoot to pieces by Pak40’s lurking in the boscage. Not long ago I finished the first three and has now painted seven. I started to build three more, but these where M4-A3E8 and didn’t enter service in Europe until December ’44 (I later found out). 2014 will not be the year where I use time on stuff that I cannot use here and now, so those are put back in their boxes and will be there until we enter Germany. 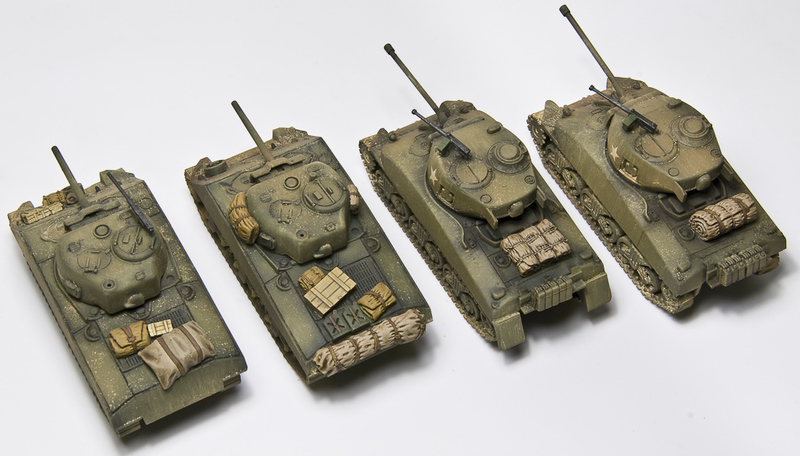 I has now ordered some PSC Shermans, that hopefully are here before the weekend. 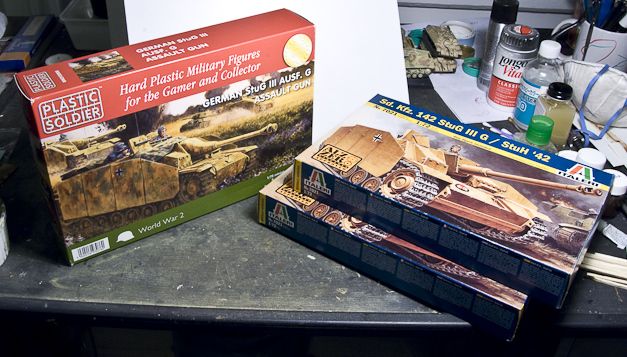 I actually ordered a really big bunch of stuff this time (I hope my girlfriend doesn’t read this), a box of PSC Sdkfz. 251’s, two Tiger II with Porsche turrets from Trumpeter, a single Sherman M4 also from Trumpeter that will get a Dozer blade, a box of PSC StuG’s, a box of PSC Panthers, two diecast Jagdpanzer IV from Easy Model, two diecast Wespe’s from Altaya, one diecast Panhard 178 also from Altaya and finally a Spitfire and a Typhoon both from Academy… Adding to these I also bought a Dragon Hummel and a box of German Artillery, including a horse tow and two 10,5 guns. After this I only need a few pieces for my US vs. German Normandie missions (it will start all over when I am going to buy vehicles for my unpainted british army). Say hello to Jimmy, Glenn, Bing and Tommy, the noise from them will be sweet music to the infantry fighting their way through the bocage.